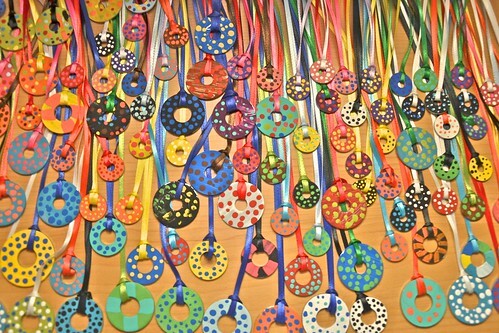 The girls spent a big chunk of the day painting and ribbon-ing lots more washer necklaces (aka “bookmarks” if you’re not a “jewelry” person). If you don’t own one of these beauties, it’s time to remedy that. We even have a fun new tiny size! The smallest necklaces (3/4 in. diameter) are $1.50 each. The rest (1 in, 1.25 in, and 1.5 in) are $2.50. If you buy 5 or more, the price goes down to $1 and $2. Shipping is $1.00 for 1-4 necklaces and FREE for 5 or more. (U.S. addresses only) If you’re confused, let me know. You can request custom colors/patterns or just be surprised. E-mail me with your orders! I apologize for the short post, but we spent two hours at Super Games with our church family tonight, and I’m whooped. Speaking of whooped, my friend Mandie beat me twice at tug-of-war (which I challenged her to because I’m still bitter about her beating me at Michael Jackson on the Wii). I will find something I can smoke her at. I did beat this dude at Jurassic Survivor. That felt good. I’m taking requests for tomorrow’s post. Would you rather hear about 1.) some cool books I think you should read or 2.) a homeschooling update or 3.) more family fun on the farm? It looks like we have to wait for a while I guess. Hope it won’t be more than a few days though. University of Georgia red and black. Georgia Southern University navy and white. I want to hear about cool books I should read and a homeschooling update. I am reading “Radical Together” right now and LOVING it!